These stuffed peppers are so good, and don’t contain a lick of rice. 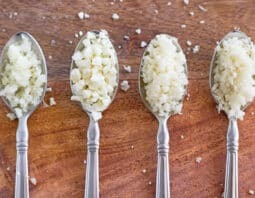 Only cauliflower rice here! Cauliflower is a surprisingly versatile veggie. I mean, who would have thought you could pulse it in a food processor to be used as a rice replacement? Genius! That is exactly what I did for this recipe to make the ‘rice’ for these peppers. Learn how here. 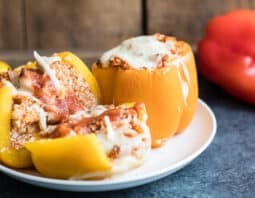 These stuffed peppers end up being very similar to the classic recipe we grew up with, but way healthier. You see, cauliflower rice packs tons more nutrients than rice into those peppers. 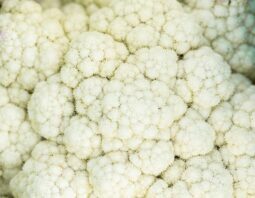 You may think since cauliflower is a white vegetable it doesn’t contain a lot of nutrition, but it actually contains Vitamin C and K and is rich in fiber and phytonutrients. Here’s some more great cauliflower nutritional info for you too. 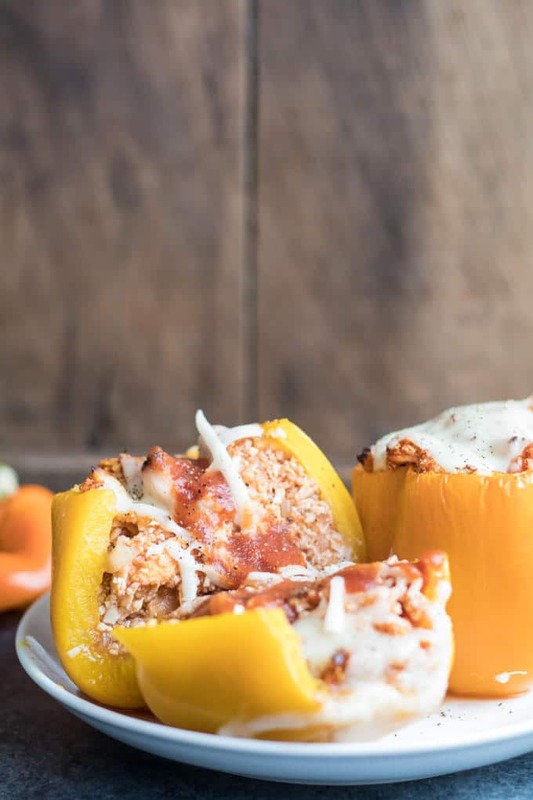 Stuffed peppers may sound like an intimidating dish, but they’re so easy and they’re ready in under an hour. If you have kids you can get them involved by getting them to scoop the filling into the bell peppers. These peppers are great as dinner all on their own or you can serve them with a yummy side salad. Heat olive oil over medium heat in a large skillet. Add the diced onion and cook, stirring occasionally until softened, about 3-4 minutes. Add in shredded chicken, salt, oregano, pepper and garlic. Stir to combine. Then stir in cauliflower rice and can of tomato sauce. Slice off the tops of each bell pepper, about 1/2 inch. Remove the seeds and membrane. Pepper should be able to stand up straight, if not – cut a thin slice off of the bottom (see how to keep peppers standing here). Stuff bell peppers with cauliflower mixture and place in a 9x13 inch baking dish. Bake until peppers and cauliflower are soft, about 30 minutes. Add cheese on top and bake for another 3-5 minutes. Enjoy immediately. Do you cook the riced cauliflower before stuffing it into the bell peppers? No, the cauliflower rice is raw when it goes into the peppers.